President Trump can still hammer crude prices lower with a tweet, but unfortunately for Larry Kudlow and Steven Mnuchin, optimistic trade headlines just don't pack the same market "oomph" that they once did. Proof of this arrived Thursday morning, when a pair of ostensibly bullish stories from Reuters and WSJ failed to revive the market's appetite for risk, even as anonymous US officials teased what they heralded as a "major concession" from Beijing on forced technology transfers, and a top Chinese official told a group of American tech CEOs about a proposal to lift restrictions on foreign cloud-computing companies. First came the Reuters report, sourced to anonymous US officials, who claimed the Chinese were "talking about forced technology transfers in a way they've never wanted to talk about it before." Though differences on IP and enforcement still exist, proposals from the Chinese "went further than in the past" on a range of issues, including the technology transfers, according to the senior officials. And while this doesn't guarantee that a deal would be reached, the officials said it's enough to support President Trump's claims that talks have been going "very, very well." The officials added that talks would continue for as long as necessary - perhaps until May, or even June - so long as the progress was being made on the "core issues." Yet, when it comes to the US lifting tariffs, the officials confirmed that "some tariffs" would need to remain in place to ensure compliance, and that this remained a potential obstacle to a final deal. "Some tariffs will stay," the second official said. "There’s going to be some give on that, but we’re not going to get rid of all the tariffs. We can’t." Finally, the officials insisted that Trump had enough political support at home to allow him to hold out for a good deal. "Who would he be pleasing by...selling out?" Moving on to the WSJ report, the paper said Premier Li Keqiang had disclosed a proposal during a Monday meeting with about three-dozen corporate CEOs to allow foreign cloud service providers to open "trial operations" in China. Executives from IBM Corp. , Pfizer Inc., Rio Tinto PLC, BMW AG and Daimler AG had attended the meeting. As we noted over thee weekend, access for US cloud companies has recently emerged as a major issue in the talks. During a Q&A session, Li offered more details about what this arrangement would look like. In response to a question about cloud computing from IBM Chief Executive Ginni Rometty during Monday’s meeting, Premier Li said Beijing is considering a "liberalization pilot" in a free-trade zone to open cloud computing to foreign companies, according to the people briefed on the matter. A key hurdle foreign providers of cloud services need to overcome, Mr. Li said, is to offer adequate "privacy protection" to their Chinese customers. Under the cloud proposal, foreign providers would be allowed to own data centers in the free trade zone. The most likely one is in the southern city of Guiyang that’s a center for big data, people with knowledge of China’s plans said. Still, as WSJ pointed out, there are still questions about how the flow of data out of the country would be treated. Key questions remain: Would China allow free flow of data from the operations in the zone to the rest of the country? What kind of data services can foreign firms setting up data operations in the zone provide? What kind of customers can they offer such services to? By offering the pilot program, Beijing is showing that it understands there will need to be some movement on this issue. However, the proposed changes might be "too piecemeal" to win Washington's support. “It shows that, at the minimum, they get the idea that they’ll have to show some movement in this area and they can’t stonewall the U.S. completely on this,” said Paul Triolo, an analyst specializing in global technology policy at Eurasia Group, a New York-based consulting firm. “But the devil is in the details." The pilot proposal, which would still allow the government to keep control of the sector, is also likely to be met with skepticism in Washington that China is moving too slowly to make any meaningful changes to what it sees as Beijing’s unfair trade practices. But Beijing officials argue China has traditionally experimented with reforms in pilot zones before ultimately implementing them nationwide. The cloud proposal “fits China’s habit of making discretionary, piecemeal adjustments rather than outright liberalization,” said Scott Kennedy, a China expert at the Center for Strategic and International Studies, a Washington think tank. Larry Kudlow affirmed many of the revelations made in these stories during a statement in Washington later Thursday morning, affirming that the talks were not "time dependent". Though he did say that he expects the final deal to include "100% ownership" for foreign firms operating in China, which goes beyond the proposals discussed above. Elsewhere, an earlier trade deal update published by the FT wasn't nearly as positive. 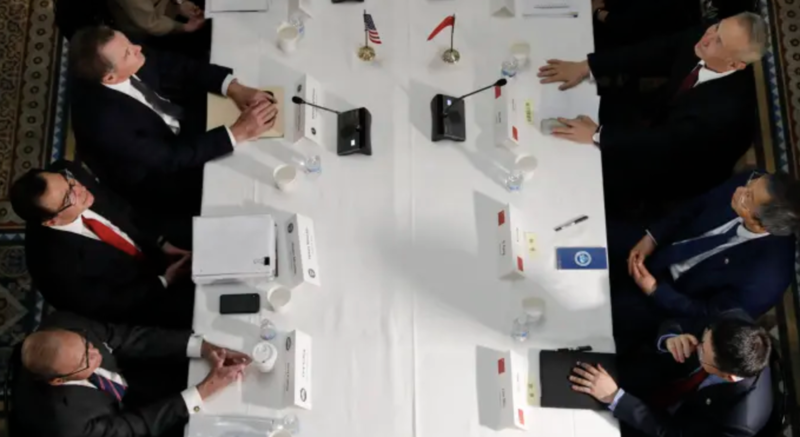 According to the story, talks have effectively been going around in circles, with the US handing written proposals to China, and China handing them back covered in red ink. This, per the FT, shows how successful China has been at resisting American demands, as even agreements on relatively minor details have been incredibly hard fought. According to people briefed on the process, US officials sent proposed drafts of what could become China’s most consequential trade agreement since it acceded to the World Trade Organization 18 years ago. Then the Chinese side sent the drafts back with strike-out marks and alternative clauses, all in red. The “red-line” documents sent back by Chinese negotiators, led by vice-premier Liu He, highlight their success thus far in resisting US demands for far-reaching structural reforms to Beijing’s state-led development model. But even agreement in less controversial areas – such as increased purchases of US exports and improved market access for foreign investors – is proving difficult to pin down. That last report sounds more like what we have heard so far. And it raises just enough doubt that the US officials quoted by Reuters are being unduly optimistic, and the proposal shared by Li is simply that - a proposal. The only solid new piece of information is that the US now expects the talks to drag on for months, but many analysts had expected as much, anyway. We now wait to see if China dashes the optimistic narrative with a series of its own leaks once they realize the US delegation won't agree to lift all of the tariffs on $250 billion in Chinese exports that have been imposed over the past year since the start of the trade war.